Never heard of Aldus Manutius? What about Bembo, Garamond and Palatino? Just a few weeks left to submit abstracts for this year’s conference to be held at the University of Melbourne, 26–27 November. Closing date for offers is Monday 29th June 2015. 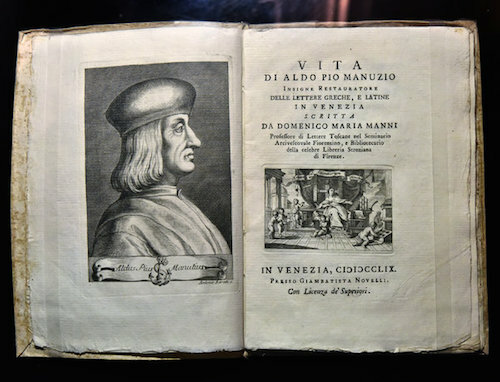 The conference is entitled ‘Turning the Page: Bibliographical Innovation and the Legacy of Aldus Manutius’ and marks the 500th anniversary of the death of Aldus Pius Manutius Romanus, one of the three great pioneers of printing (along with Johannes Gutenberg and William Caxton). Manutius worked predominantly from Venice during his twenty-odd-year career before passing on the business to his son and grandson. He had a vision of disseminating Classical culture, much of his output being editions and translations of Greek, and some Latin, texts. He established an academy of scholars to prepare Greek MSS for printing and even learned and used Greek at home and in the print shop. A central figure in Renaissance classical culture, his academy corresponded with the circle of scholars like Erasmus and Thomas Linacre in Henry VIII’s London. Technically and aesthetically, Manutius introduced a string of innovations including typefaces like Bembo, Garamond and Palatino, regularised punctuation, and scholarly introductions, but the innovation for which he is most famous is the italic font. This was intended not as mode of emphasis, however, but simply as a technique of compaction. For Manutius saw the advantage of making small-format books that could be carried in an overcoat pocket, and from 1501 printed smaller octavo editions that could be made thinner if printed in italics. Manutius’s books show the rapid evolution from manuscript pages. On the one hand his pages have a neat type-bed with justified margins, and occasional flourishes such as tapering column- or page-endings which look very modern, while on the other the books are issued with arcane abbreviation conventions and with indicative blocks awaiting hand-coloured initials in the manner of an illuminated manuscript. Manutius had a wonderful sense of what these days are called ‘production values’. Manutius is just the starting point, however, for while the conference is anchored in and celebrates his pioneering achievements, it recognises that innovation and change have been hallmarks of the practice of printing, publishing and book distribution ever since, and invites offers of papers which exemplify, historicise or theorise such developments from all centuries and locations. The keynote address will be given by founding member of the Society and former President, Professor Wallace Kirsop. An expert on French bibliography, Professor Kirsop has chosen to approach Manutius and the universe of biblio-innovation via the compiler of the first serious bibliography of the Aldine Press, Antoine-Augustin Renouard (1765–1853). His talk is provisionally titled ‘The Age of Renouard’. Enquiries and proposals of 250 words for papers of 20 to 25 minutes should be sent to Anthony Tedeschi (atedeschi@unimelb.edu.au), Curator, Rare Books, Baillieu Library, The University of Melbourne. The deadline for paper proposals is Monday 29 June 2015. Students undertaking higher degree research are encouraged to submit offers of ‘work in progress’ papers; some travel bursaries will be available. We All Like a Good List, Don’t We! 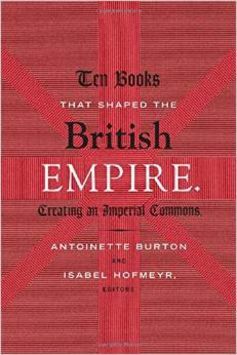 This is a repost of an article by Isabel Hofmeyr, one of the editors of the brilliant collection Ten Books that Shaped the British Empire. I had the privileging of meeting Isabel and some of the contributors to this volume when she out in Melbourne for the Writers and Readers conference at University of Melbourne. Here Isabel talks about the interesting challenge of choosing the ten books. When we talk about books, we generally think only of their inside – the words, ideas and themes that they contain. But what about the outside? Books are objects in the world. They undertake all kinds of work that exceeds just their words – they forge friendships, decorate our houses, store our momentoes and memories. Yet, much of this printed matter was not copyrighted – all periodicals for example legally reprinted material from each other. These carpets of print culture created a type of commons across empire, a zone of textual production not owned by one person. Isabel Hofmeyr is Professor of African Literature at University of the Witwatersrand. All over the world, for hundreds of years, people have been making, collecting and presenting book-objects that reflect their devotion and respect for books and for each other. There are countless examples; they include bars, cameras, radios, banks, toys, memorials, food tins, desk accessories, book safes, musical instruments, magic tricks, furniture and jewelry. Blooks embody the same characteristics as books and many take the form of specific titles and book formats. Book lovers like me might prefer the real thing, but to Mindy and other scholars, blooks signify ‘knowledge, education, taste, power, wealth and more’. She explains her research as part of scholarly and popular interest in the ‘book as object’, which has grown as the codex has come to be perceived as an endangered object. Mindy is head of the Sherman Fairchild Center for Book Conservation at The Metropolitan Museum of Art. She is in the process of preparing the first exhibition of blooks to be held in the USA. As far as she knows it’s only the second such exhibition in the world. Read more about it on her blog, About Blooks. Over the summer holidays, when I was walking my dog in the mornings, I noticed an older guy who was often in the local park, lying under a tree reading, losing himself in a book the way all committed readers do. After a few days it dawned on me that he was homeless. I was struck by the fact that my husband and I had just spent days culling our overflowing bookshelves of volumes we no longer had the space to keep. My husband had become tired of lugging heavy boxes of books down to our local thrift shop. Our book collection had become a problem to us; the reader in the park was a stark reminder of a very different problem faced by the many people who love reading but do not have easy access to books. As usual, google informed me that someone else had already thought about all this. The Footpath Library, an organisation that distributes books in good condition to homeless readers, was set up in Sydney in 2003 by a volunteer who noticed a homeless man reading a novel under a street light while he waited for the nightly food van. From Sydney, the Footpath Library has spread to Brisbane, Melbourne and Perth. They’re not big yet, but they are growing. The organisation welcomes donations of new or secondhand books in good condition. There are some restrictions: they can’t accept textbooks or books of true crime, for example. But children’s books are welcome along with many types of fiction and non-fiction for adults. Read more about how to donate here. I love how the Society for the History of Authorship, Reading and Publishing (SHARP) puts its money where its mouth is, by presenting its journal, Book History, as a very traditional-looking hardback in blue cloth binding with gilt lettering. I love the National Library of Australia, particularly the archives there. I always thought that when I died (hopefully at some far distant date) it would be lovely (if no doubt impermissible) to have a few of my ashes sprinkled in the manuscripts reading room on level 2, near the window with the view of Lake Burley Griffin and the flowering cherry trees. That room was my idea of heaven. Sadly, however, all in the name of improvement, readers of manuscripts are now directed to a refurbished internal space on level 1 in the centre of the building. It’s much bigger, for sure, and elegantly fitted out, but it is no longer possible to sit close to an external window. It also lacks the charm and companionable atmosphere of the previous room, which was much smaller, and where you might have found yourself bumping elbows with a luminary historian or national cultural icon at the next desk. This is not the end of the changes, either. Last week when I was there on a rush visit which included Saturday, I found that the library has changed its rules and no longer retrieves books from its collections on weekends. A friendly member of staff whose name I do not know told me this was due “mainly to budget cuts”. The inconvenience to visiting scholars is great, and has either not been thought through, or is not considered a priority. Having hauled myself up to Canberra at my own expense, prepared for two days of blitzing the archives, I was disappointed and frustrated to find that books I wanted to consult as cross-references to the papers I was working on were not available because it was a Saturday. Some of these books are only available in the NLA, not other libraries. Had I known I needed them, I could have booked ahead, reserving them by Friday afternoon. But the whole point of digging in the archives is discovery: often you don’t know what works you’ll need for cross-referencing, because you can’t anticipate everything you might turn up in the papers. Just to top off this whinge, I note that although the new reading room is larger, the reference collection from the old reading room has been consolidated. Yes, you might now be able to look up the Dictionary of National Biography online, but it’s definitely not the same as that physical process of cross-reading which to me is such an integral aspect of working in a traditional archive, and which leads to so many serendipitous discoveries and insights.